'It's hard to pour just a little Champagne," says Sharon Cohn with a smile, after I remark on the healthy pours of sparkling wine lined up on the bar at Breathless Wines. The little sparkling wine brand with a big heart has opened a new tasting room just in time for the holidays. Breathless was founded in 2011 by Cohn and her sisters, Rebecca Faust and Cynthia Faust, in part as a tribute to their mother, who died of the rare lung disorder Alpha-1. But there's more to the moniker than that: "We were always breathless behind her, because she was always charging up the hill!" Cohn explains of their mother's enthusiasm for the outdoors. The brand, which donates to a list of charitable organizations, is really about joy and exhilaration, says Cohn. The tasting room is plunked down—literally, the components were plunked down with a crane—in a relatively out-of-the-way industrial zone of Healdsburg that's only a short walk west of the Plaza. Fittingly for the locale, it's constructed from three shipping containers, which were purchased in new condition and expertly welded together over the summer by a metalworker who was just getting warmed up for Burning Man, according to Cohn. The mix of art deco and industrial chic works in this free-standing building, conveniently nudged up to a warehouse winery chock-full of state-of-the-art sparkling wine equipment; it's one of three facilities operated by custom crush outfit, Rack & Riddle, cofounded by Rebecca Faust. While massive gyro pallets mechanically riddle cases of wine, outside, the tasting room opens into a bar with access to a pleasant, tree-shaded patio on warmer days. There are plans for a pizza oven. Besides reasonably priced sparkling wine, sourced from Sonoma and Mendocino counties, Breathless offers fine poster prints of its label art imported from England, attractive Champagne tulip glasses, Good Works bracelets and props for impromptu 1920s-themed Polaroid fun. We'll take a closer look at the wines in our annual sparkling wine guide next week. The newest of the lineup, Breathless Blanc de Blancs ($29), is my current favorite: piquant like pineapple, creamy like lemony custard. 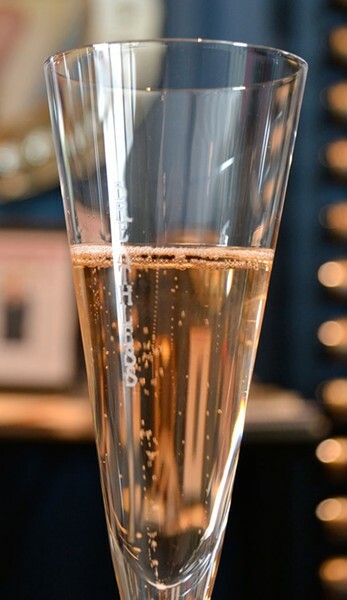 The Blanc de Noirs ($30) adds toastiness to the raspberry soda flavors of the pinkish, rosé-like North Coast Brut ($25), while the Sparkling Rosé ($32) brings on more than just a little touch of raspberries and cream. Breathless Wines, 499 Moore Lane, Healdsburg. Open Thursday–Tuesday, 11am–6pm. Tasting fee $14. 707.395.7300.